The 2002 Boston Red Sox season involved the Red Sox finishing 2nd in the American League East with a record of 93 wins and 69 losses. October 9, 2001: Craig Grebeck was released by the Boston Red Sox. 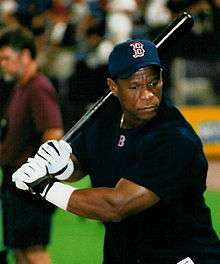 February 13, 2002: Rickey Henderson signed with the Boston Red Sox. Pedro Martínez became the first player to win 20 games in one season but pitch less than 200 innings. Seven Red Sox players were voted on to the American League roster for the 2002 All Star Game played in Milwaukee at Miller Park. Pitcher Derek Lowe, left fielder Manny Ramirez and third baseman Shea Hillenbrand started the game, while pitchers Pedro Martínez and Ugueth Urbina joined shortstop Nomar Garciaparra and outfielder Johnny Damon as reserves. April 27, 2002: Wayne Gomes was signed as a Free Agent with the Boston Red Sox. June 26, 2002: Alan Embree was traded by the San Diego Padres with Andy Shibilo (minors) to the Boston Red Sox for Dan Giese and Brad Baker (minors). July 30, 2002: Cliff Floyd was traded by the Montreal Expos to the Boston Red Sox for Sun-Woo Kim and Seung Song (minors). A Sarasota Red Sox Florida State League Billy Gardner, Jr.